There is no such thing as an information recession with more data being generated, processed, moved, stored and retained longer. In addition, people and data are living longer as well as getting larger. There are economic challenges requiring new outside of the box thinking boosting your return on innovation (the new ROI) and return on investment (traditional ROI). Key to support various types of business environments and their information technology (IT) / ITC applications are cost effective, flexible and resilient data infrastructures that support virtual machine (VM) centric solutions. This StorageIO Industry Trends Perspective thought leadership white paper looks at addressing the needs of Microsoft Hyper-V environments to address economic, service, growth, flexibility and technology challenges. The focus is on how software defined storage management solutions unlock the full value of server based storage for Hyper-V environments. Benefits include removing complexity to reduce cost while enhancing flexibility, service and business systems resiliency along with disaster recovery without compromise. Primary audiences include Small Medium Business (SMB), Remote Office Branch Office (ROBO) of larger organizations along with managed service providers (Cloud, Internet and Web) that are using Hyper-V as part of their solutions. There are many challenges facing those responsible for IT. Many challenges are common across SMB to large enterprise workgroup, ROBO along with service providers (Cloud, Internet, and Managed). For example, there is the need to move, process, protect, preserve and serve more information for longer time while enabling robust customer responsive services in a cost effective way. 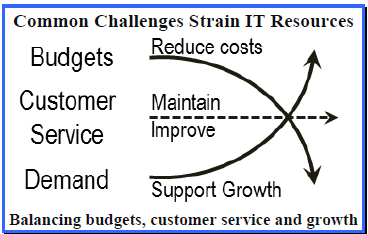 The result is shown in the figure to the right where common challenges squeeze IT resources and services. Something else that is common across various environments is the usage of Microsoft Windows based server and software solutions, along with Hyper-V server virtualization technology. With constrained budgets while needing to support growth and business resiliency (BR), organizations need to rethink their data infrastructure options to remove cost and complexity. One way to remove costs is addressing complexity while unlocking the value in resources (hardware, software, people) enabling them to do their work more effectively. Another way of removing costs is to streamline your data infrastructure environment. Data infrastructure includes hardware (servers, storage, I/O networking), software and management tools to support your business information applications. Many organizations address challenges including those previously mentioned by using server virtualization for consolidation, along with leveraging larger shared storage area network (SAN) solutions. While SAN solutions using Fibre Channel (FC), Fibre Channel over Ethernet (FCoE) along with other networking interfaces and storage systems can work for larger environments at scale, one size or approach for all environments is not always the best option. 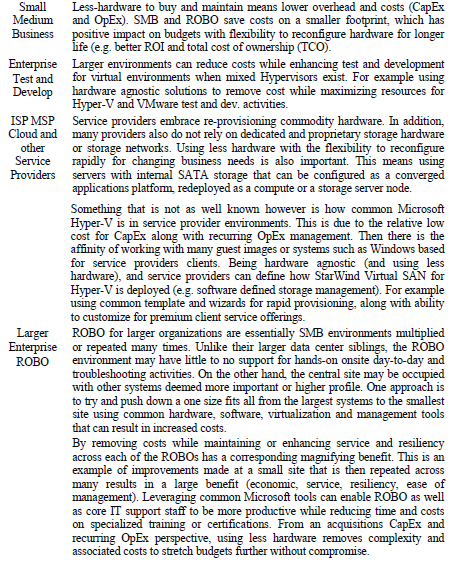 Larger environments are focused on scaling up and out in terms of performance, availability and space capacity. In addition, larger environments tend to have highly skilled server virtualization, storage and networking staff or on-site vendors to take care of the various technologies being used often in centralized locations. On the other hand smaller environments need solutions or approaches that scale down. Scale down should not mean adding complexity for the smaller environment. Likewise, scale down should not mean removing features, functions, performance, availability and capacity from a larger solution to provide at a lower cost. Businesses and organizations have different needs, as not all are the same. Likewise not all solutions are the same being optimized for different situations. Why treat everything the same, or force one approach on every situation? Why not use the right tool or technology solution for the applicable situation and environments needs? They may sound the same, however there is a difference. Removing costs is finding and fixing problems including reducing complexity. In addition to lowering costs, there is the added continued benefit of improving productivity during growth. View removing costs in terms of improving productivity without compromising quality or service level. For example avoiding a one size fits all thinking. Cost cutting usually results in a compromise of service quality or some other impact. Cutting costs often means going with cheap where removing costs means eliminating complexity while seeking value to become more effective. Simply cutting cost can also result in higher costs elsewhere including staffing, new tools or training. Removing cost also means more than simply shifting CapEx 1 costs to recurring OpEx spending. Instead, find a balance between lower CapEx spend acquiring what you need when you need it, along with lowering your OpEx by reducing administrative and other recurring costs. Budget busters are solutions that have a high CapEx or OpEx cost that may have hidden long-term costs. These costs can be requiring too much hardware, software or both for what is needed to support an organizations data infrastructure and application needs. Another form of a budget buster is a solution that appears to have a low up-front, or lower cost per individual component, yet more components such as server nodes are needed. Costs can be amplified by higher recurring OpEx spending. Budget (CapEx and OpEx) and costs are a concern across all organizations from the largest to the smallest. Smaller environments typically do not have the luxury of economies of scale that come with size to spread costs across many systems. In smaller SMB and ROBO environments there are not as many systems resulting in a higher cost overhead to share across fewer systems. For cloud and service provider environments the cost crunch comes from removing complexity and cost to keep service offerings price competitive while meeting performance and service objectives. No one system, solution, technology or tool fits all needs or environments. This is why there are different data infrastructure resources including operating systems, virtualization tools, networks, servers and storage. Some people may be surprised given the popularity of VMware that Microsoft Hyper-V is so widely deployed. VMware vSphere is arguably the largest revenue based deployed server virtualization hypervisor in the industry. Likewise, many of the guest operating systems on VMware are Windows based. Besides in enterprise, Hyper-V is also widely deployed in SMB, ROBO along with in some cloud and service provider environments. Hyper-V is popular due to many factors including relative low cost of entry (budget friendly), along synergy for supporting Microsoft guest or virtual machine (VM) operating systems and applications. Hyper-V also continues to gain in popularity by addressing IT / ITC staff skills experience. In the above-mentioned environments staff size may be small with Microsoft Windows experience while lacking Unix/Linux (*nix) or other special training. Hyper-V is based on Microsoft Windows technology and tools. This means staff learning curves are quicker, less costly and the staff may already know the tools. Hyper-V is found alongside Open Source software technology in many service providers due to the popularity of Microsoft Windows in many environments. Another theme is keeping storage close to where the applications use data reducing storage networking traffic and costs. Instead of large expensive SANs, many service providers use commercial off the shelf (COTS), commodity, white box (non-name brand) or name brand servers with low cost SATA Hard Disk Drives (HDD). The result is a hardware agnostic data infrastructure with the flexibility to be reconfigured to meet various needs while reducing costs. The next truly revolutionary industry first innovation will be software that does not require hardware, or software the does not need hardware. Until then, even software solutions that use cloud and virtual hardware still require physical hardware somewhere. Hardware regardless of where located still requires software to define the management and functionality to be useful. What is changing is that less hardware is needed with some solution approaches than others. Also, keep in mind that some solutions are sold or packaged as being hardware-less meaning you choose new hardware or use what you already have. There are hardware agnostic software defined storage solutions packaged as an appliance for ease of acquisition, also known as “tin wrapped software”. Solutions combing compute along with storage hardware and software are referred to as “converged” systems. Add a virtualization “hypervisor” and you get an industry buzz term “hyper-converged”. Remember, hardware needs software, software needs hardware, and there are solutions that require less hardware or software. What is the best storage option for Microsoft Hyper-V environments? The answer should be it depends! What is good for one environment and usage may not be the best for another. This means the best storage option should depend on what you are doing along with requirements. For example, what size is your environment, types of applications, number of remote sites, performance, availability, capacity and economics (budgets), staff skillsets and applications among other criteria. A candidate solution should require less hardware while providing flexibility without compromise. To support sharing of direct attached storage (DAS), a solution should be hardware agnostic while removing complexity. Another consideration is for the solution to reduce CapEx along with OpEx budget costs. This means being Microsoft Windows and Hyper-V administrator friendly (complimenting Microsoft tools and staff experience) to remove complexity and costs. environment. There are many Windows (or other operating systems) running on dedicated hardware (servers and internal DAS storage) using common networks. 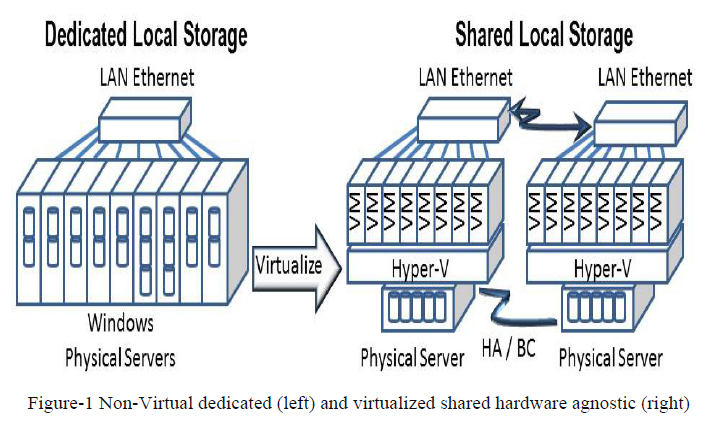 On the right-hand side is shown a high-availability (HA) dual-server configuration with Hyper-V server virtualization and shared DAS using less hardware. The key to the solution on the right is hardware agnostic storage management software that integrates with and complements Microsoft Windows and Hyper-V while unlocking the value of commodity hardware. An ideal candidate solution should also provide simplicity in terms of deployment, ease of use, coexistence with your existing data infrastructure networks, hardware, and software management tools. 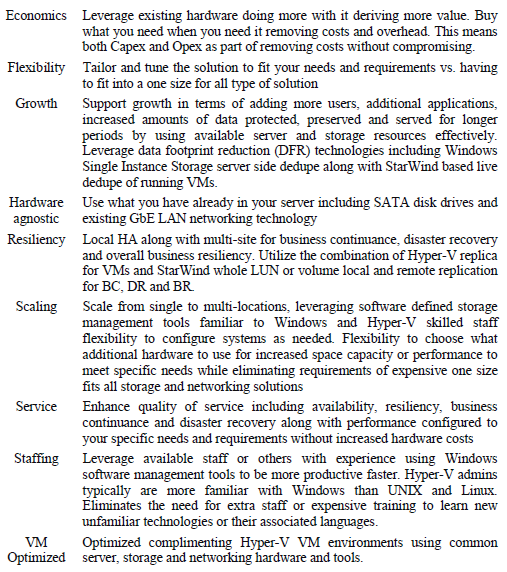 o Flexibility to choose hardware and redeploy based on your organization needs. StarWind Virtual SAN is an example of a Hyper-V solution that is hardware agnostic providing software defined storage management. In addition to complimenting Microsoft Windows and Hyper-V management tools, StarWind Virtual SAN also requires less hardware. This results in lower CapEx and OpEx costs. 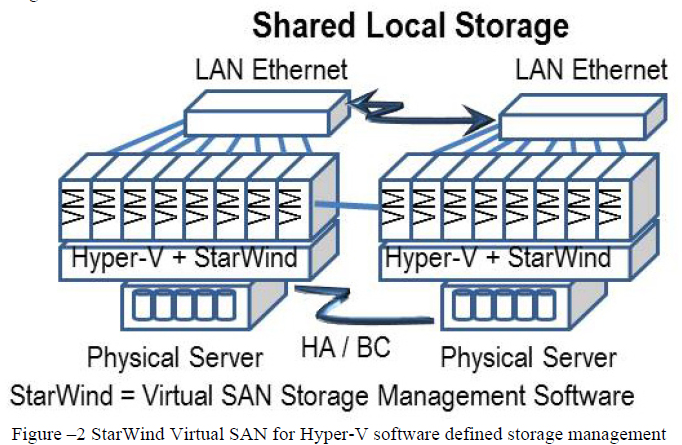 One of the examples of how StarWind Virtual SAN uses less hardware is that it is able to provide high-availability (HA), Business Continuance (BC) and resiliency capabilities with two physical servers. This differs from some other solutions that require three, four or more physical servers and their associated I/O networking and storage hardware. In addition to being able to do more with less hardware, StarWind is also flexible to scale beyond the limits of some single or dual physical server node solution architectures. For example, the StarWind flexibility supports scaling down as well as scaling up and across multiple sites adapting to your environment needs. In figure-2, StarWind Virtual SAN is shown leveraging commodity servers and SATA DAS storage in a hyper-converged environment (server, storage and software). Note that StarWind Virtual SAN storage management software is installed in the Hyper-V hypervisor as opposed to residing as a guest virtual machine. This capability provides closer integration with the Microsoft Hyper-V technology along with being Windows administrator friendly. Being Microsoft administrator friendly removes OpEx costs. For HA, BC and DR, StarWind Virtual SAN has the ability to run on as few as two servers for resiliency compared to other solutions that require three or more servers. This also eliminates the need for additional cluster quorum or voting servers and storage resulting in less hardware. By requiring less hardware, up-front CapEx purchases are reduced, as are hidden recurring OpEx costs or fees. By not requiring higher-cost SAN FC or SAS SAN switches and HBAs (e.g. less hardware), organizations have more flexibility to reconfigure, redeploy as needed to meet changing business needs. 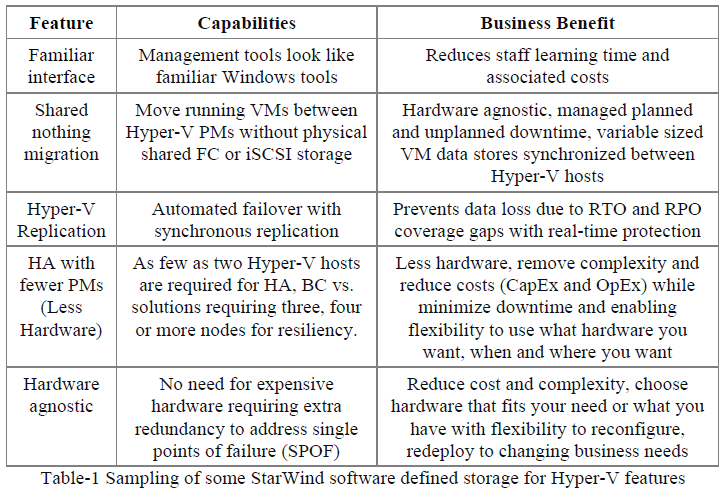 Other StarWind Virtual SAN features and benefits are shown in table-1. Part of reducing cost is removing complexity, which means leveraging what you have more effectively from a hardware, software, network and people staffing perspective. This also means aligning technologies that work with and complement each other. Following are a tips and recommendations tied to using StarWind Virtual SAN for Microsoft Hyper-V environments to address various challenges. There are various challenges, issues and opportunities for different types of environment from SMB, enterprise ROBO to service provider among others. Likewise there are various storage options for supporting Microsoft Hyper-V environments, however while some solutions may be stretched or squeezed to try and fit all needs, they may do some with compromise in other areas. Software Defined Storage means many different things to various people, however the focus should be around how software defined storage management unlocks the value in the server, storage and I/O networking hardware along with associated software. By unlocking the value of your CapEx and OpEx acquisitions, you are able to drive your return on innovation (the other ROI) while enhancing your financial TCO and ROI (return on investment). Using hardware agnostic software defined storage management solutions such as those from StarWind that compliment Microsoft Hyper-V drives further efficiency, effectiveness and productivity for various environments. Instead of cutting costs, look to remove costs. This means addressing hardware, software as well as enabling your available staff to be more productive leveraging what they know, and are familiar with. Greg Schulz is Founder and Sr. Analyst of independent IT advisory consultancy firm Server and StorageIO (StorageIO). He has worked in IT at an electrical utility, financial services and transportation firms in roles ranging from business applications development to systems management, architecture, strategy and capacity planning with over three decades of applied experience. Mr. Schulz is author of the Intel Recommended Reading List books “Cloud and Virtual Data Storage Networking” and “The Green and Virtual Data Center” via CRC Press and “Resilient Storage Networks” (Elsevier). He is a fivetime VMware vExpert. Learn more at www.storageio.com.